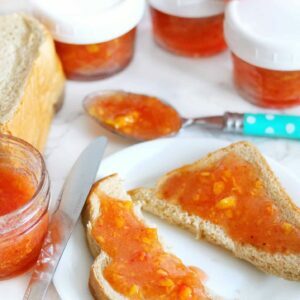 Peach Freezer Jam- Easy & Come Out Perfect Every Time! 6 cups white sugar I know, I know… keep moving forward, ignore it! Add peeled, halved peaches to food processor. Pulse until desired size is reached. I like small pieces. In a heavy bottomed pan (do not use aluminum), bring 3/4 water & pectin to a boil. Stir constantly. Reduce heat to medium low, add peaches and sugar. Mix well. Continue mixing until sugar is dissolved. It will seem like the sugar is never going to dissolve and also like there is way too much of it. I promise, there isn’t. No matter what… keep going! Do not reduce the sugar! Laddle into clean jars. Cover and let sit on the counter over night.